Butterfly Dec 24 2018 3:03 pm For me the biggest masterpiece of his 'til now would be Mr Sunshine. I can't even put into words how much i enjoyed the drama. Everything was beautifully done and there were many scenes with subtle or should i say subliminal relevant meanings to the story which is sth i very much enjoy. And the cinematography was breathtaking. 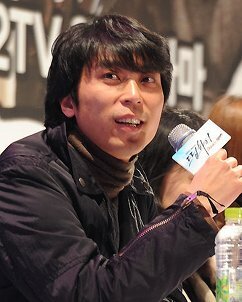 Hoping he and writer Kim Eun Sook continue on with making blockbusters, can't wait for their next collaboration. kang dedot Dec 07 2018 3:39 pm I am a big fan of Him, i watch all his work in movie, The best director for K-Drama.. i realy realy realy amazed how he make the Cinematography for all the movie he make. I dream i can get experience to work with him learning how he make a bautiful cinematography in movie because my passion is cinematography. Respect for Mr. Lee.. hope in the future you can take a location for your movie in my country Indonesia. I'm always waiting for your next film Mr. Lee Eung Bok. Raul Oct 13 2018 11:48 am Lee Eung-bok is a dazzling genius. Mr Sunshine is a brilliant work. The director gets the very best from all of his actors. He sets each scent perfectly. Everything he did in that series was done with flawless perfection. Indonesia Guy Aug 21 2018 1:58 pm As a director, he has the best directing ability that can be said in South Korea in my opinion. If you watch DOTS, Goblin, and Mr. Sunshine you will realize that these three dramas are directed by him without the need to find out through articles, news or other media. Most directors will use a point of view that is easily understood by the audience so that sometimes many Korean drama lovers stop to continue watching until it's finished because they feel they already know how the ending is. "Could it be that I have not permeated the essence of this drama story so that my suspicions sound awkward or precisely because I have unconsciously become one part of this drama so that it is like a character in this drama, of course I also look forward to what will happen at the end of all the conflicts that took place in the drama this?" I think if he made a book about how to become a director, I would gladly buy it because I think being a director is a great job and needs a strong mentality to keep on pursuing this field. Sarah Aug 07 2017 11:41 am Iam a big fan of kim Eun sook and lee Eung Bok couple, together you are making a wonderful drama .Iam so excited to the next drama Mr . sunshine. Please continue with your amazing work...fighting♥♥♥♥♥♥. Jenny May 03 2017 10:13 am You made another excellent piece again! Thank Mr. Director. You are the best! I love you and thank you for the Goblin and DOTS. adswerf Feb 13 2017 6:58 pm aaaaah i really enjoyed goblin thank you sooo much to you mr director and mrs writer and the casts and all the staff involved, i am really amazed by the view you captured and every moment is just gracefully perfect on my screen, thank you!! Ebon Jan 23 2017 5:58 pm Mr. Lee Eung Bok, I'm a little bit heart broken as of the moment because Goblin has just ended. But congratulations to you, to your staffs and all the cast.. Everything was brilliant hoping there will be an extended episodes or part 2 instead. I will surely miss this series. Kip Hert Jan 22 2017 9:07 pm Goblin; The Lonely and Great God is a Master Piece! Goblin is the most beautiful show I have ever watched. The casting is perfect, the interactions are superb! I can't praise you enough. Thank you for creating this wonderful show. moon aunos Jan 19 2017 12:12 pm Wao, congrats mr. Lee Eung Book, your latest work Descendants was really amazing, but Goblin... Goblin is simply magic! everything in this drama is really really good.. The plot, characters, ost, shots and scenography are poetry in every little frame of this jewel... My most sincere cogratulations, this drama will be awared for more than one or two awards beacuse the hard work deserves it. zaidaniza Dec 27 2016 3:49 am thank you so much with the story of goblin. The plot of the story is best it beyond our knowledge & u make it happen so nicely. I hope the end of the story will have happy ending. Ismiyana Dec 24 2016 9:22 am Goblin suprised me, you are really good director for this drama, and descandent of the sun too. But in goblin you make evertything seem real, for editing, and every scene really details and cinematography. I hope your next project will be awesome too. ? hany Jun 06 2016 7:30 pm Mr.Eung Bok i really like your job of Descendants of the sun. And i am surprised to know that you're directed some of my favorite drama. Always fighting ahjusshi! Ainah May 28 2016 10:42 pm Hello ? Director Lee ;-) Ainah Grande is my Name 15 years of age and also I'm a Filipino I'm already Done to watch the Drama you made 'Descendants Of The Sun' ... I cry a lot for that Drama ! even it's already Midnight I'm still watching it ! maybe you know Lee Ji Eun ? (IU) I want Song Joong-ki and IU tp be Partner ! I really Ship Them ! there is a flag in 00:59:20 time and it has some arabic characters on it . "ةح ل س م ت اع ا م ج" arabic is right to left and words don't have space between their characters , characters stick to each other until the word is over so the right way is: "جَماعَت مُسَلَّحة" which means : people with guns!! terrorist don't use that kind of names they use + names so they can find some new members like muslim brotherhood ,... some thing like that ... it has a pretty name but it's ugly inside . Ma gidita tubo Mar 29 2016 6:49 am Descendants of the Sun my first korean drama for 2016 which i love to watch because every episodes are worth watching no dull moments and we cannot predict how the story goes so im glad im watching this and still keep on waitng for the episodes to come.two thumbs up for Director Lee Eung Bok you did a great job and all your previous dramas you did were all marvelous .A director like your caliber Korea will be so much proud of all your achievements in your choosen field.Congratulations and more dramas and movies to produce in the near future. Any Mar 26 2016 6:04 am Congratulation to Lee Eung Bok, because drama Korea is Descendants of the sun that's very good. I hope waiting there's session 2 later. I am waiting. Thanks. Eva Lee Mar 16 2016 10:33 pm I am enjoying Descendants of the Sun, so I decided to look up what else the director has done, and I am surprised to find that he's directed some of my favorite shows. Keep up the good work, Lee Eung-Bok. You have a beautiful eye. momo Mar 04 2016 7:25 am Ajusshi, your work is awesome.. I love all your work!! keep fighting!!! dramaas May 10 2015 3:34 am mr. eung bok please make a new musical drama something like dream high~ Dream high is such a great drama, but not dream high 2. Please co-operate with SM ent, or YG ent, or maybe JYP ent again. It will be an interesting drama if you can cooperate with that 3 entertainment. I will wait until you made this kind of drama, kamsahamnida. Alaiza Apr 06 2013 3:22 am Good day,annyeonghasseyo sir, I'm one of the thousand fans of Dream High here in the Philippines especially for Kim soo hyun and Suzy or what we call here HYUNZY COUPLE. And as a huge fan of Dream High and this two, due to public demand for this year or next year may we request? another great love story drama for Kim soo hyun and Suzy for the fans! if ever happen in behalf of HYUNZY COUPLE fans from different part of the world or SOOSU COUPLE in Korea from the bottom of our heart thank you so much! kamsahamnida:D we keep us supporting you :)) God Bless! Harryel Feb 25 2012 4:13 pm I just hope, it would have dream high 3, 4, 5 and so on! ^.^ I love watching it! And i know i'm not the only person who wants to watch Dream High!! And i mean it's not a bad idea to change the cast but i'm very curious about the last episode of Dream High 1 because i really don't know how it ends! :( But i was very excited that it has Dream High Season 2! I hope it will also have Season 3, 4, 5 and so on! JOE Dec 23 2011 3:09 am Ok, I was happy with Dream High, but I am weary of Dream High 2, I want to know why you would change the cast when the first season's story was not completed. Second, Are you planning on reuniting the first cast in Dream High 3 (if we like 2) because I will watch 2, but if it's not good as the first, OR BETTER, then I don't care about a season 3.